Fleet owners today are offered a wide array of sizes and specially designed lift trucks to suit unique purposes. The choice of equipment is a significant decision in the throughput, efficiency and safety of their operation. And, underneath it all, their choice of tires for the forklift is one of the most important factors in the ongoing operating cost of their facility. Every aspect of forklift operation affects, and is affected by, the tires on which they run. As new forklift technologies have developed, the demands on their rubber has shifted, too. Compared to the equipment of 10 or 20 years ago, forklifts now are called upon to deliver faster duty cycles to support escalating demands on supply chain logistics. Today's drive systems are able to accelerate quickly to top speed, then brake just as fast, creating more stress on the machine's tires, wheels and axles. This, in turn, generates more heat: the #1 killer of duty-cycle tires. With the emergence of larger-sized models and more specialized applications, forklifts are often expected to move loads that are heavier than ever, as well as moving them faster. More weight, naturally, means more stress on the tires. But the effect of these heavy lifts is also multiplied by extra heat produced by the machine itself as it raises and lowers these loads at ever-increasing heights. New applications have led to new attachments, replacing the traditional front forks with devices that further alter the machine's work profile. In steel and paper mills, forklifts equipped with coil clamps will not only move with their loads offset, but will rotate them as well. A load in motion, of course, intensifies the stress on the wheels and tires. 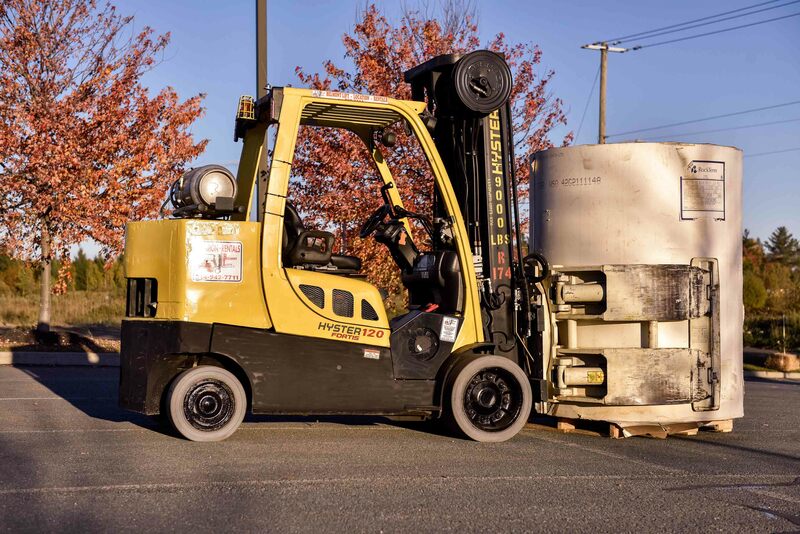 As the trend to battery-powered equipment continues, facility managers need solutions to ensure that their forklift fleet can run through complete shifts without time off to recharge. Experience has shown that the rolling resistance of the truck's tires can have a major impact on battery life and, therefore, it's a key element in preventing downtime and maximizing machine availability in the shop. As is the case with other mobile equipment, tires are the single most significant item in a forklift's operating cost. As a wear part, the tire's initial purchase cost is a key consideration, but the cost of unexpected tire failure and consequential downtime is far greater. Frequently operating in tight spaces with high traffic, dependable tires are also essential for workplace safety. However, buying forklift tires is unlike tire purchases for most other equipment. Conventionally, equipment managers match the tire type and tread pattern to the machine's working environment. Choices are made according to requirements for speed, traction, durability and hazards on varied climates, soils and surfaces. When choosing tires for forklifts, buyers must not only focus on where the machine is used but more importantly, how it's being used. Over and above environment, usage intensity is the most important variable. Intensity can be calculated according to a variety of loading factors, operating hours, distance travelled per day and cycle times. Application intensity reflects the amount of heat stress inflicted on the tires by the forklift's duty cycles. Increased travel time and distance means increased heat buildup with less cooling time between cycles. Heavier loads increase friction while the forklift is in motion, and also subject the tires to more machine heat through its lifting cycles. For more personalized purchasing advice, consult with your forklift maintenance and tire specialist to discuss your specific usage patterns. Don't forget to discuss the intensity of your application with your forklift OEM, too. Whether you are spec'ing new equipment or developing your fleet maintenance plan, match the right tire to your equipment and operation to ensure safety, dependability and lowest operating cost for your forklift.